In this final installment, I have a few more things to say on the subject of story construction, and then some other miscellaneous tips for the intermediate-level story writer. Part 3 of a 3-part article. Breaking Blocks - Breaking My Will to Live. If you are a gamer or an avatar collector like me, then chances are you love a challenge. This article will look at each Altador Cup and will showcase my opinion of the best and most fun prize from each year’s prize shop. I will take several things into account –rarity, uniqueness, and usefulness, just to name a few. Hopefully reading through this article will give you a motivation to hit the stadium and get playing! Petpetpets are the next evolution of pet ownership and everyone who is everyone has seen one by now! Here we'll break down a few facts about them, as well as taking a closer look at a few of my favorite! 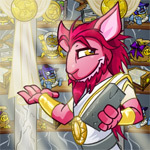 Welcome to the Terror Mountain edition of The Best Souvenirs in Neopia! This edition is sponsored by Taelia the Snow Faerie, in hopes that with more tourism brings more people in to do her quests! As this year’s Altador Cup beings with a bang, I decided to follow my journalistic urges to pursue an interview with the best team yet, Haunted Woods (of course, that’s completely subjective, but still—HAUNTED WOODS FOR LIFE!). The sun was fully down and the moon shone brightly in all it’s glory. What had caused Brujyh to be out at such a late hour? Well none other than Count Von Roo. They didn't understand. That's why Kespri decided to run away. When they were both ready, Marcia headed out the door and straight to the field where her friends said they would be playing during the festival.